Ivan Tsarevich (Russian: Ива́н Царе́вич or Иван-царевич) is one of the main heroes of Russian folklore, usually a protagonist, often engaged in a struggle with Koschei. Along with Ivan the Fool, Ivan Tsarevich is a placeholder name rather than a certain character. Tsarevich is a title given to the sons of tsars. He is often, but not always, the youngest son of three. In the tale "The Three Tsardoms", he is a son of Nastasya the Golden Braid. Different legends describe Ivan as having various wives, including Yelena the Beautiful, Vasilisa the Wise and Marya Morevna. Ivan is sometimes depicted with magic abilities and has the Sword Kladenets. Ivan is the main hero of Russian folktales. He is almost always portrayed as either the third son of a peasant family or the third son of a king. In the latter stories, he is called Ivan Tsarevich, which means "tsar's son." Ivan is one of the most common Russian names. The friends and foes of Ivan Tsarevich are often mythic figures, from magical animals to deathless beings. The most famous folktale featuring Ivan as the protagonist is "Prince Ivan, the Firebird and the Grey Wolf". 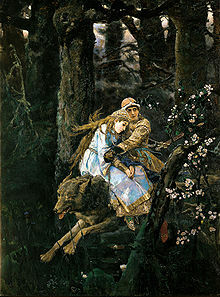 In this story, Ivan was aided by a magical wolf as he captured the firebird and won the hand of a beautiful tsarina. The firebird inspired Igor Stravinsky's ballet of the same name. In another famous tale, part of which was also used by Stravinsky in The Firebird, Ivan Tsarevich married a warrior princess, Maria Morevna, who was kidnapped by the immortal being called Koschei the Deathless. In this tale, the animal helpers were a lion, a bird and a magical horse that belonged to baba Yaga. It was on this horse that Ivan defeated Koschei. Ivan the peasant's son has as many tales as Ivan Tsarevich. One of the best known is the story "the Little Humbacked Horse", in which a magical, talking horse helped Ivan to become a hero and marry the princess he loved. Tales about Ivan Tsarevich include "Ivan Tsarevich and the Grey Wolf", "Tsarevna the Frog", "The Sea Tsar and Vasilisa the Wise", "The Tale about Rejuvenating Apples and the Life Water", and "The Death of Koschei the Immortal (also known as "Marya Morevna")." ^ Russian Fairy Tales. Pantheon. 1945. ISBN 9780394730905. ^ Ivanits, Linda J (1989-02-15). Russian Folk Belief. ISBN 9780765630889. This article about a fictional character is a stub. You can help Wikipedia by expanding it. This page was last edited on 17 April 2019, at 15:42 (UTC).